SyncDir is quite simply the world's fastest directory synchronizer to replicate or backup data. And this without requiring anything installed at either end. On a gigabit network with few source changes, SyncDir is six times faster than RoboCopy on ordinary synchronization and hundreds of times faster on synchronization with permissions. Because of its performance, SyncDir is commonly used for backing up users' documents in logon scripts. An FTP version of SyncDir is available here. The reason you need this command is that users may save PST files in various folders, making it impossible to automate backups without a command like this. The BackupPSTFiles command will flatten the location of all PST files and see them as one big pool as the source directory. Refer to the Outlook page here for context information on using the BackupPSTFiles command. You can use SyncDir in your own scripts or you can let the Home Screen build a Backup App for you. The last option is extremely simple. 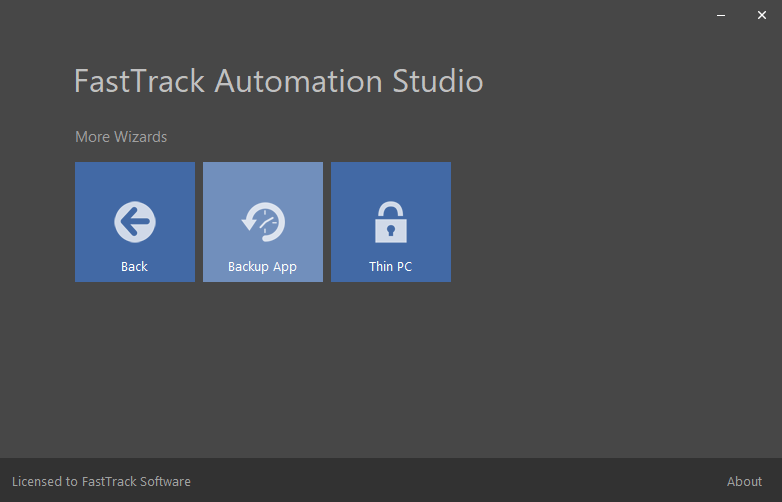 Click the "Backup App" icon in the Home Screen under "More Wizards", answer a few questions and you have a backup app that you can either use for user ad-hoc backup or include unattended in your existing logon scripts. If you have already set up a FastTrack logon script, you can just include the SyncDir command directly in your script. This is explained further down this page. The rest of this page will focus on the first option, which is to build your own custom scripts in the Script Editor, using the SyncDir command for various purposes. Let us have a look at using the SyncDir command in a custom script in the Script Editor. In the movie below the script line from the header of this page is used. SyncDir is so fast that we need a substantial amount of files to clearly see what happens, which is why some 37.000 files are put into the source directory in the movie. There are 350 new or changed files and the destination folder is on a 100 mbit network. The whole synchronization process takes about 20 seconds; if there would have been no changes, the process would even drop to under 10 seconds. In a typical backup scenario a user has much less files, and with few files typically changed, a logon script backup would typically be a matter of a few seconds to execute with SyncDir. As you can see in the movie, the graphical user interface of SyncDir while executing the synchronization is intended for end users. Therefore it looks simple, but still provides a bit of insight to what's going on without confusing the end user with too much information. The simple logon script above is shown in the movie below. Printers would have to be connected based on the content of the variable "Printers", but all graphical interfaces are built-in and the SyncDir command does a complete back up. If Portable Then WriteFile [UserDesktopDir]\Backup My Files.fsh,"SyncDir [UserDocumentsDir],[UserHomeDrive]\Backup"
If the user deletes the desktop icon, it is simply created again at next logon. See the logon script page for information on setting up logon scripts. Press play on the video below, if you would like to see Senior Technical Writer Steve Dodson from Binary Research International walk you through how to set up SyncDir for laptop backups in a logon script. From version 8.1, a cancellation button is shown by default on the user interface. You can remove this button by using the DisableSyncCancel command. When you are using SyncDir for backup of users' files, you should allow your users to postpone the backup by pressing the cancel button. A cancellation is completely safe; when the user clicks the cancel button and confirms the cancel, all current I/O operations will flush and the overall operation is cancelled as soon as it is possible without corrupting files. If you need to detect that a cancellation has happened in your script, you can check this with the LastSyncWasCancelled condition. A classic backup problem is backing up Outlook PST files, where users typically archive their older mails. These files can be multiple gigabytes in size, making them hard to back up, but SyncDir will split large files into smaller fractions and operate on a per-block basis instead of a per-file basis. Typical backup solutions require you to install software on the destination computer to achieve this behavior, but SyncDir does not require this. When files are over 50 megabytes in size SyncDir will switch to block level operation. The first time a file is copied, it will copy the entire file, but on subsequent backups only changed blocks are copied. The user interface of SyncDir is kept simple to the end user, but the way you can tell if it is skipping blocks, is that the status will say "Scanning" instead of "Queuing". 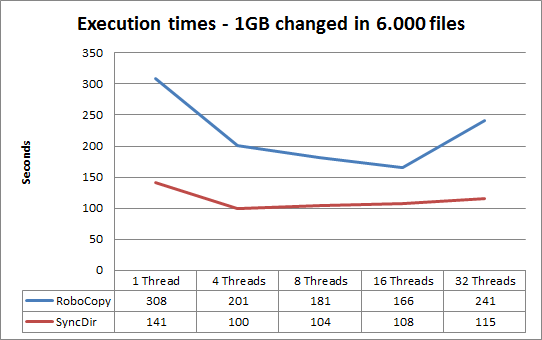 Internal tests on several gigabyte PST files with marginal changes show a drop to about 5-10 seconds to back up the files. The threshold of when SyncDir uses block-level operation follows the large file threshold and can be changed with the SetIOThreshold command (see further down). Typically only laptop computers must run a backup, as desktop users would store their files on network shares already. To filter out desktop computers, the "Portable" condition should be used. There are some other scenarios to consider when writing your SyncDir script line for backups. What happens if the user logs on to another laptop? Then it would overwrite the backup files from the other computer. To get by this, note how the [ComputerName] function was appended to the path in the above examples to ensure that there is a backup directory for each computer that performs the backup. Another scenario that is typically forgotten to think about until it's too late, is when a user gets the computer re-installed. Then the user needs to restore the files, but the first thing that happens is that the user logs on and gets all the backup files removed, as the source directory is now empty. You can of course get by this by using the "Ask" condition to ask the user, if they want to back up every time they log on. But this would be annoying to the user in general, so the better solution is to use the [WindowsInstallDate] to test, if it was actually re-installed today and then simply not do the backup. As an additional data safety, SmartDock can be used to remind laptop users to refresh their backups; check here for more information. SyncDir will by default use 8 threads when synchronizing data. This means that potentially, 8 files can be copied at the same time. It might not seem logical that performing I/O operations in parallel over sequential copying is faster, but it is, due to various transfer latencies. Let's look at a single threaded approach to copying a file over a network. First a file has to be read, while the destination awaits receiving the data. Then it will most likely be scanned for viruses before it even leaves the source computer to travel over the network, which again has handshaking and other latency operations. Once the data arrives at the target computer, data will most likely be scanned for viruses again and then written to disk, while the source computer is idle. In most cases, the virus scanner will be the bottleneck in transferring files, resulting in idle I/O time. When doing the processing in parallel, idle time will be reduced. If your source and/or destination are located over multiple disks like in a SAN setup or either are solid state disks, parallel processing will improve performance dramatically. But even with single drive source and/or destinations, parallel processing is still faster, as modern harddisk optimizations like read-ahead and native command queuing will help favoring parallel processing. 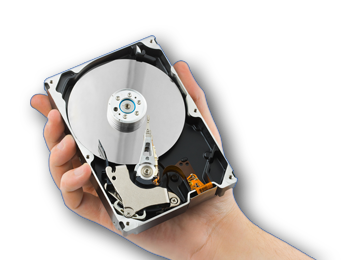 The example in the next section will use a single SATA disk destination. There are however some cases, where it is not faster to execute file copying in parallel. When files are a certain size, the latency time drops and parallel copying will most likely slightly decrease performance. For this reason, SyncDir has a threshold where it does not use parallel processing. By default, any file over 50 megabytes will be queued for sequential copying, when all parallel operations are complete. If there are for instance 3 files of 600 megabytes in a set of 1000 changed or new files, the 997 other files are copied in parallel first and at the end, the 3 large files are copied sequentially. The optimal threshold in any given scenario depends on the source and destination hardware, but 50 megabytes is considered a relatively optimal threshold in most scenarios. This threshold (and number of threads used) can be tweaked, if desired - see further down for more details. 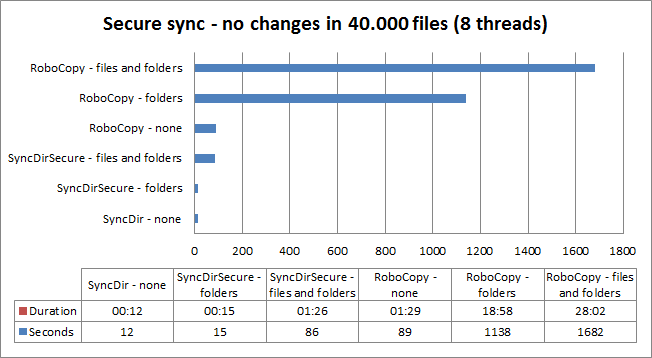 To get comparable data of the SyncDir performance in relation to other sync tools, performance data for the same tests with RoboCopy will be overlayed in the charts. Using at least 4 threads is still faster than using just one thread. 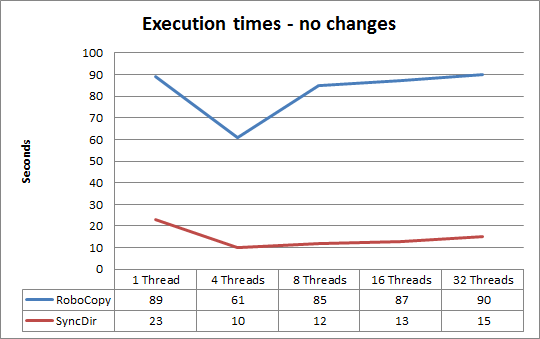 This is because much time is still used on various latencies, so operations in parallel still outperform a single threaded execution. 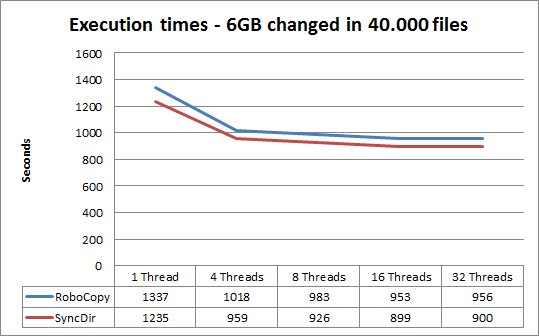 Using over 16 threads, there is no longer a performance gain in this setup for either, as the graph flats out or even climbs when increasing threads. However, if the destination was a SAN, increasing threads will in most cases produce an even further drop in execution time. Now the difference between 4 or more threads comes closer to using just one sequential thread, because most of the execution time is now spent reading and writing files - and therefore SyncDir and RoboCopy now perform close to identical. By default, SyncDir will use 8 threads to copy files and use a large file threshold of 50 megabytes. These settings can be changed by issuing a SetIOThreads and/or SetIOThreshold command before using a multi-threaded command. The following commands will use multi-threaded execution and use the number of threads defined with the SetIOThreads commands: SyncDir, SyncDirSecure, CopyDir, CopyDirSecure, DeleteSubFiles and DeleteDir. Specifying 1 will disable multi-threading and perform all operation sequential regardless of SetIOThreshold setting. The different between SyncDir and SyncDirSecure is that SyncDirSecure will also synchronize permissions. As a rule of thumb, the overhead is up to 20 percent over SyncDir. The more files that are changed or new, the less the overhead becomes. With just a few changes in the source, the overhead becomes marginal. There is one thing to be aware of in relation to synchronizing permissions, which is the file permissions dilemma. If permissions have been changed on files (not folders) in the source or destination without any content changes and without being new files, this change can only be detected by scanning permissions on all files as well as folders. The problem with this is that scanning file permissions on all files is a very costly operation to solve a problem that is not real. Setting explicit permissions on a single file is not best practice, because if this file is deleted and created again, the permissions are inherited from the parent directory. Combine this with the fact that permissions are copied when a file is new or changed, this scenario becomes extremely unlikely and should it happen, it is not a disaster as long as folder permission changes are detected and synchronized. Folders are always scanned because these are parent objects to inherited permissions on files and subfolders. For these reasons SyncDirSecure will by default not identify file permission changes for existing unchanged files. This behavior is also default with RoboCopy; refer to this TechNet article. * If content is changed in the file at the same time, permissions are still copied. The most interesting parameter in relation to synchronization is the performance, when there are no or few changes, as this is the most typical scenario. If we go back to the first performance chart and run the same tests, this time including synchronization of permissions, it becomes clear that scanning files for changes in permissions will dramatically increase the execution time. Once a day all the files in the user's documents directory are backup up to a the user's home directory. But to preserve space, a set of well-known file types are excluded like music, movies and pictures. The computer name is included in the destination to avoid accidental deletion of data, in case the user has more than one portable computer or gets a replacement. There also two commands called SyncIncludeFile and SyncIncludeFiles. These do the opposite, which means that it includes files only that match, which could be useful for example when backing up PST files and all other file types must be excluded. Two collections named LastSyncFiles and LastSyncChangedFiles are also available to get a list of total and changed files respectively. The example below is an application that will ask the user for a source and destination and synchronize the files from the source to the destination location, asking to overwrite, if destination exists. 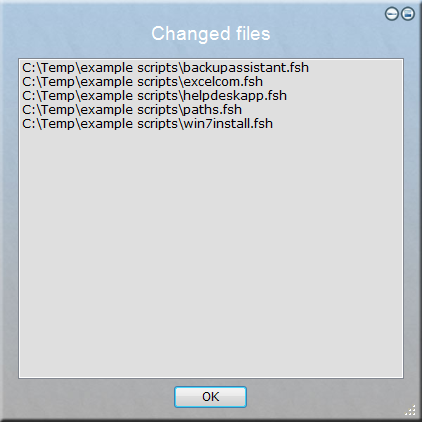 This script can be pasted directly into the script editor, by selecting the "Backup Assistant" menu item from the editor menu "Documentation -> Insert Example Script". Note that the version extractable from the script editor uses CopyDir instead of SyncDir to avoid accidental deletion of files during testing. Would you like to see changed files?" Once backup is completed, the script shows a summary of the synchronization. Answering "Yes" will show a list of changed or new files, as shown to the right. This example application could be modified to your users' needs. The script could then be available on a public network location to have users self-service themselves with backups. The script could also be compiled into a single exe file and be given to your users, to allow them to back up their data on other locations. Please refer to this page for information on how to compile your script into an exe file.